2017 marked the 50th anniversary of the end of Southern Region main-line steam on British Railways - and it was also the 75th anniversary of the introduction of the 'Q1' class. 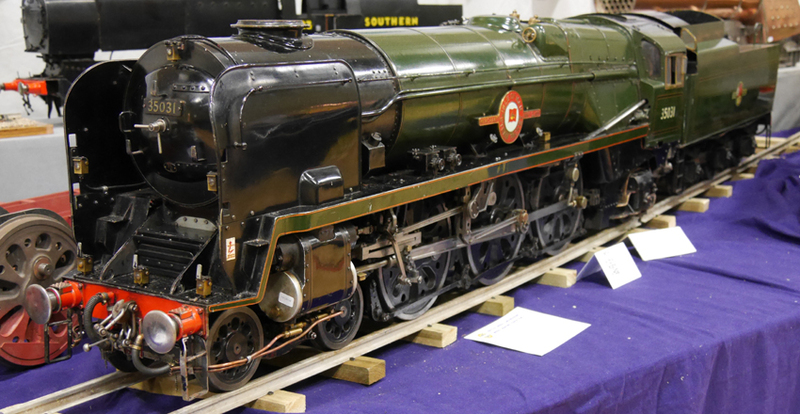 So we took the opportunity to put together a special display of models for the 3 day Bristol SMEE Exhibition at Thornbury, under the banner of the 'Bulleid Builders Group'. This collection was an informal gathering of model locos designed by OVS Bulleid - last Chief Mechanical Engineer of the Southern Railway. Many of his designs were still in regular use as the curtain fell on Southern steam in 1967; and stories emerged about now legendary 100 mph runs. 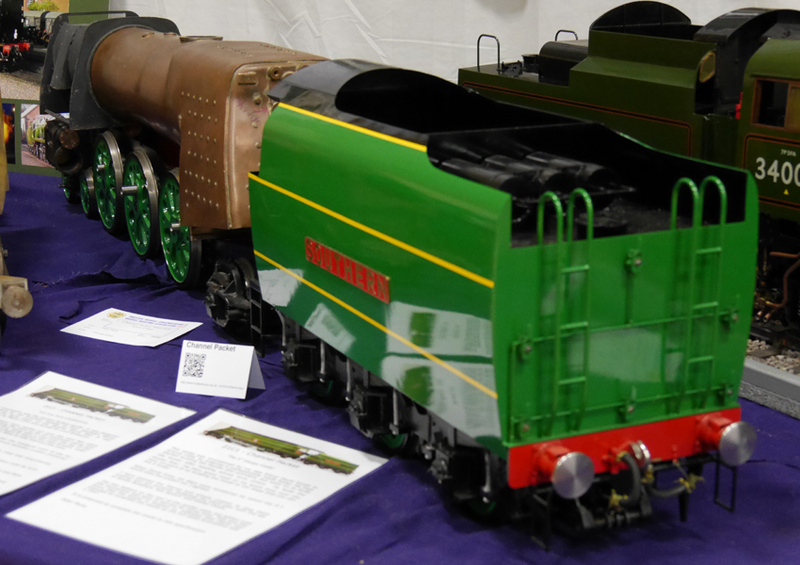 Many of the models on display are ones described on the web-site, for which many of the builders / owners travelled a long way to display at the Show, some making a holiday out of coming to this event. 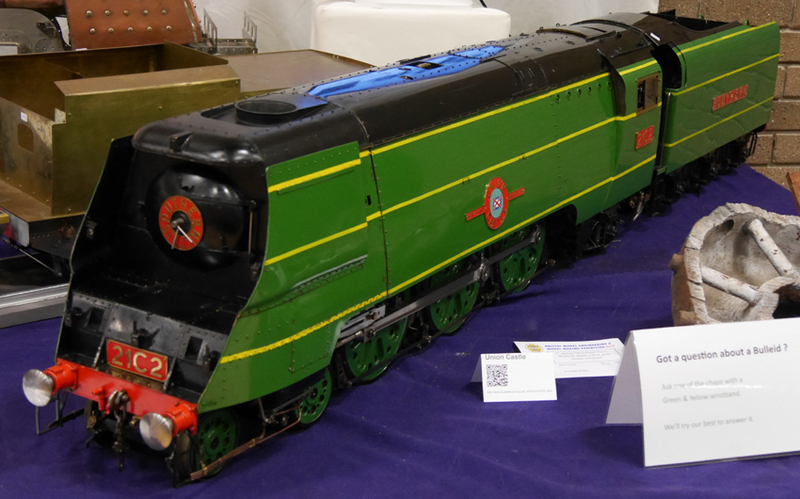 There was a mix of original and rebuilt Merchant Navy and West Country classes, and three Q1 class models, in various gauges, a high quality fibreglass bodyshell and a 3D printed body, so a good mix. I think it is true to say we were all thrilled to have so many large Bulleid models in one place. 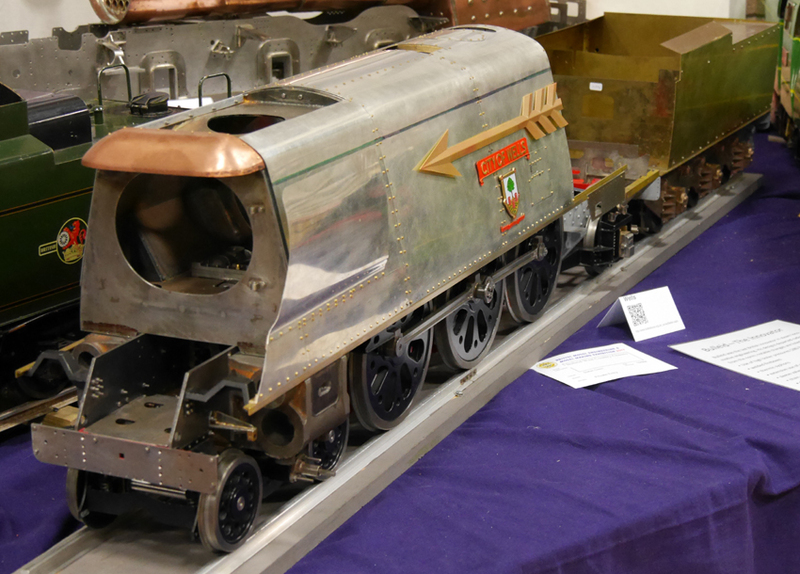 The display was supplemented by videos of Bulleid models in action, a West Country class nameplate, working electric lamp, a presentation coffee table, examples of full size boiler parts, photos, drawings and information panels. 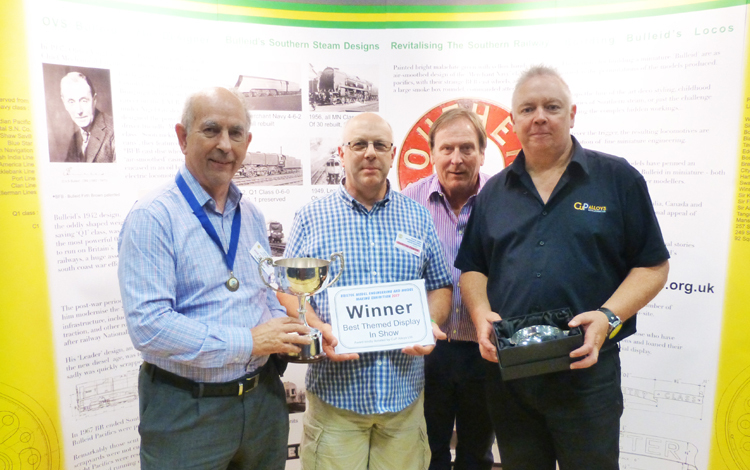 It was brilliant the our display was awarded 'Winner of the Best Themed Display at Show' on Saturday, receiving the Cup Alloys Trophy from Bernard North of the Bristol Society, and Shaun Meakin of Cup Alloys. I'm afraid the photos don't quite capture the impact of the display, or the buzz that the stand generated. We had very positive comments, some from ex-Southern footplate staff; and the display stirred a number of childhood memories with visitors - like seeing the Bournemouth Belle running fast behind a Bulleid pacific, and other such encounters. All the exhibitors were issued with Malachite green wristbands [ as many of us hadn't met each other before, that helped with recognition and introductions ], which made us visible to visitors to ask questions, which they did. A big thank you to Kevin N, John C, Will P, Pete, Bernard, Anne, Les and Lee, Alan, Nick T, Bob G, Quenton, Bob H, Nick F, Tony, Mike, Stefan, Will N, and John L for loaning or bringing their locos; Chris P for behind the scenes work, and especially to Ali for making the all important visual backdrop. 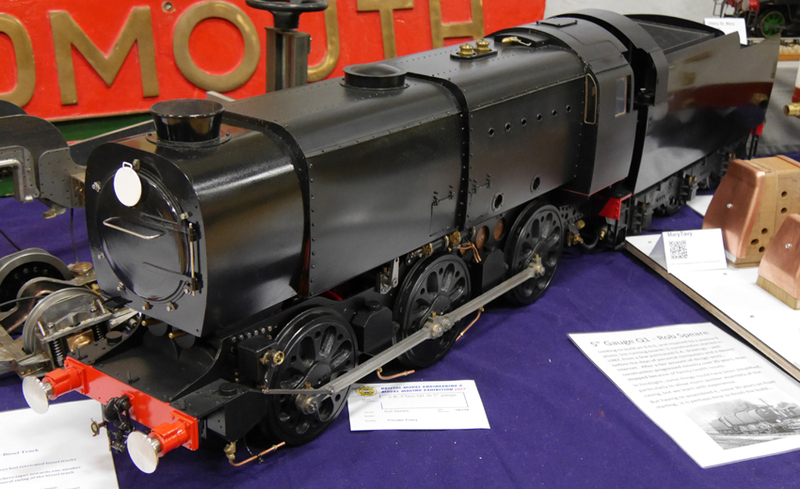 It was lovely to see Alec's fine 3.5 inch model of 'Ottery St. Mary' on show again; particularly as Alec's story was the one that kicked off the Bulleid Locos web-site. This loco is over 50 years old, but still in fine running condition. Based on the Pamela and Maisie designs by LBSC. Kevin has just re-started working on his 'Ariel' based Merchant Navy chassis, after a 20 year lay-off. A few parts have been remade to correct errors in the drawings, and I anticpate Kevin will make good progress with his build. This super detailed 5 inch gauge model of 'Wadebridge' is under construction by Les. Still looking splendid was Bernard's fine 5 inch gauge completed model of 'Padstow', built to original works drawings over many years. 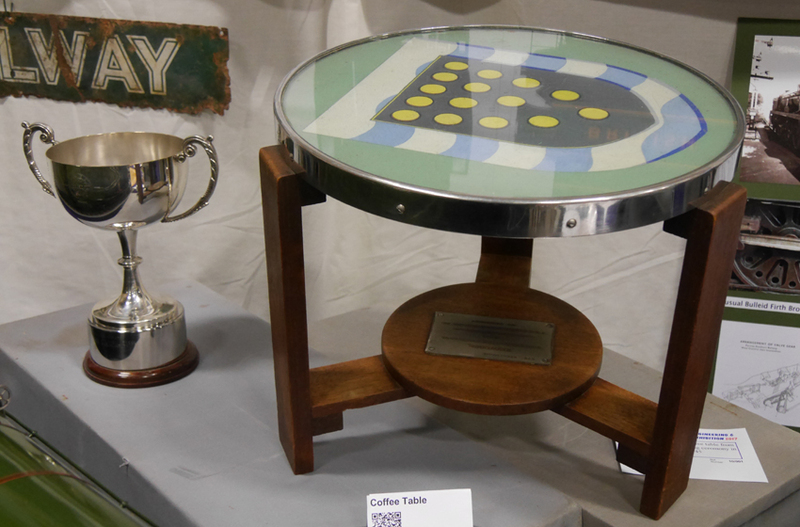 Alongside Bernard's model, we were privileged to be able to display the original Presentation Coffee table given to the Mayor of Padstow for naming the original Southern Railways loco in November 1945. Also in the photo is the Cup Alloys trophy kindly awarded to the display. On display for possibly the first time was the chassis of another rebuilt West Country class, Yeovil. This has been built to a very high standard by the late Mike Gispson who was a member of the Colchester Society. 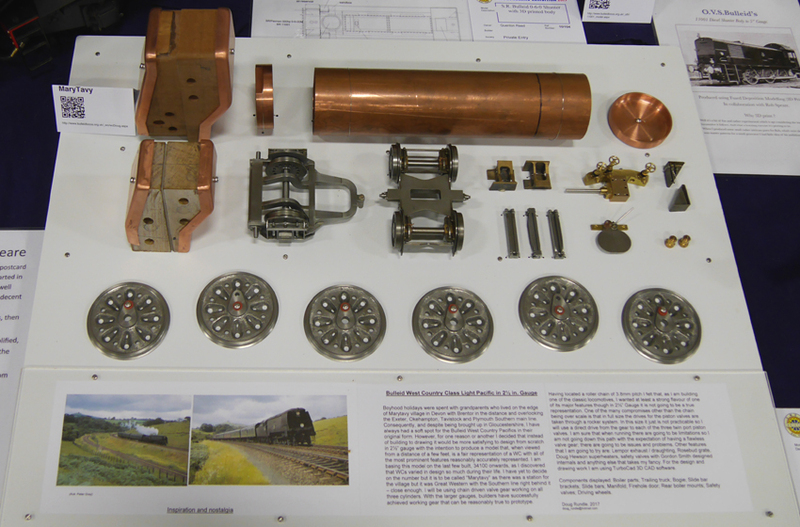 The progress on Doug's 2½ gauge West Country was nicely presented on a display board, the bogie and trailing trucks are a work of art. Doug has put a lot of work into the design side, in an attempt to iron out most of the flaws before bulding too much. This is Nick's second Q1 build and it is a very competant loco, and favourably portable compared to some locos on display. Nick is now working on a 'proposed' tank version of the Q1. Nick described building of the first Q1 in Model Engineer. Exhibited for possibly the first time was David Smith\'s built of \'Channel Packet\' in early guise; turned this way to display the magnificent tender he completed. Sadly David passed away in 2016, and gave his build to long-time friend Peter, who kindly loaned it for display. 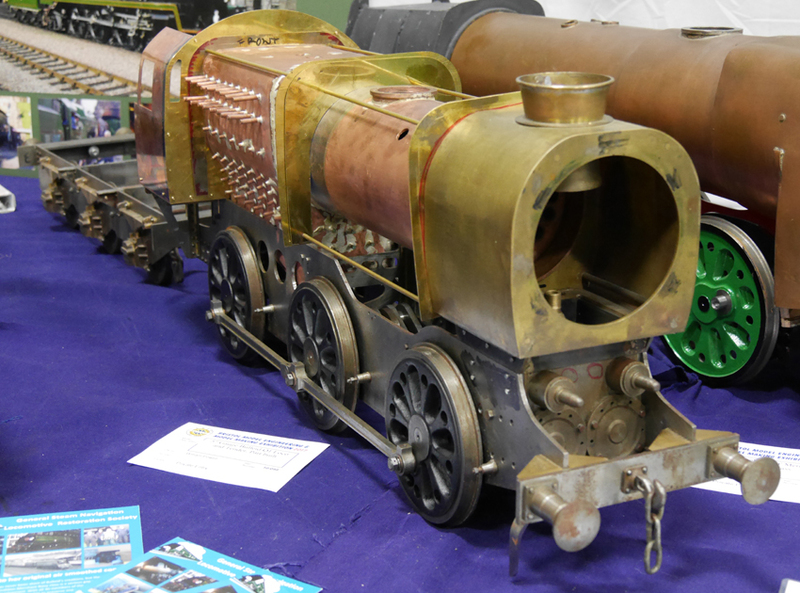 Very welcome on the display was Mike's superb and competant Ariel based locomotive in 5 inch gauge. This rebuilt Merchant Navy class example is named 'Isle of Man Steam Packet Co Ltd' in recognition of the war time efforts and losses of that shipping line. Mike's loco has competed in IMLEC (an efficiency competition), and may do so again. 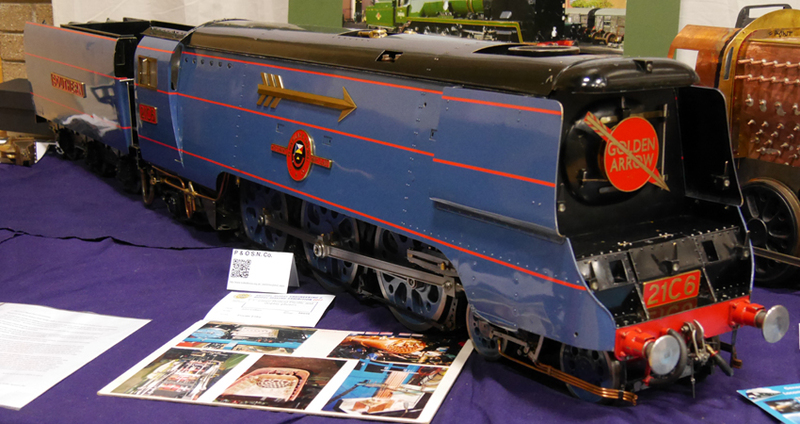 It was pleasing to see this particular loco on the display, I think Gerald Chandler actually started this with his father, I conversed with Gerald across many years about his loco. Sadly Gerald also passed away in 2016 (too young) before he could complete this or many other projects. However his loco is now in the capable hands of Will, who is going to complete the loco after 30 + years. As the photo shows, Will had already started on the boiler, which has since been completed. Some years ago I was contacted by Ian Lawrence telling me about his build of an original Merchant Navy class. Frustrated by a number of components going rusty, Ian restarted the project with component manufacture from stainless steel (except the boiler), and the chassis includes a lot of good tig welding in the motion brackets. Again sadly Ian died of cancer before the project reached completion. Will Naylor has taken on this ambitious project, and hopes to take the project forward to the same standard that Ian set. John's model of the original version Merchant Navy class has competeted at IMLEC several times. Last year John gave the loco a thorough overhaul, and fitted with a rosebud grate which has improved performance. Tony has been progressing his Ariel based project over the years. 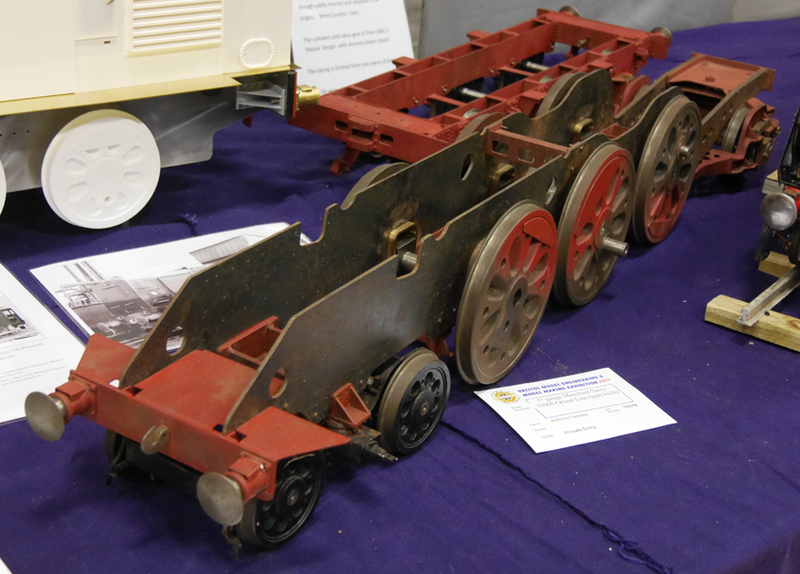 We very pleased He brought along the rolling chassis for both loco and tender chassis for the display. 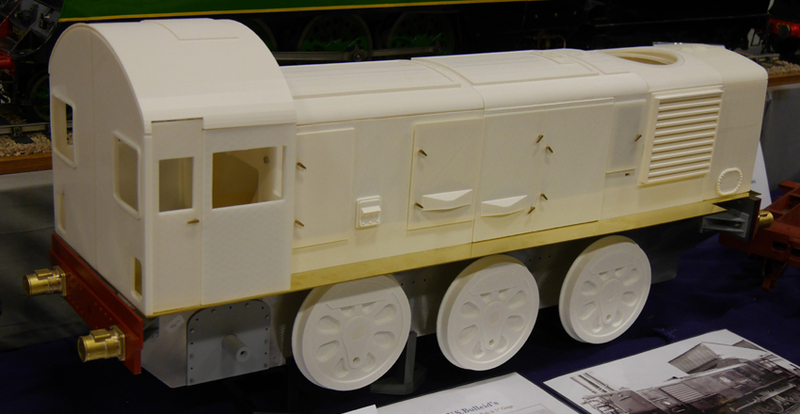 This loco under construction was the only non-steam Bulleid design on the display, and perhaps just as innovative as Bulleid's own locos. Modelled to scale externally, but electric powered, the upper body has beeen produced by Quenton entirely as a series of 3D printed ABS panels that bolt together. The wheel patterns are also being produced this way. For a number of years we have been able to see the excellent progress on Stefan's reproduction of 'City of Wells' at the Bristol exhibition. As seen in the photo, Stefan has recently been concentrating on creating the air-smoothed casing using tin-plate, and is making a superb job of it. Last on display at Bristol 10 years ago, Rob's Q1 now has a shiny coat of paint, but is still in need of completion of many fiddly items. 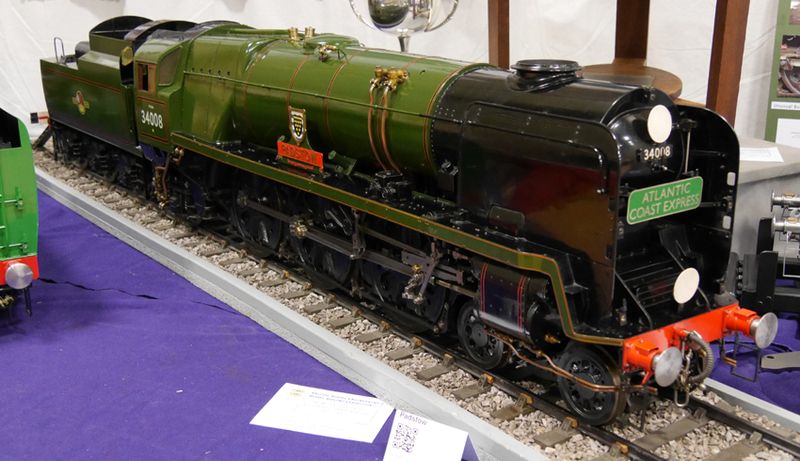 John's superb model of Union Castle is finished in bright malachite green. The loco boasts three cylinders and scaled chain driven valve gear, and has John has competeted in IMLEC trials with this several times. 21C2 runs really well, though living up to the full size reputation, she can be fairly coal hungry. 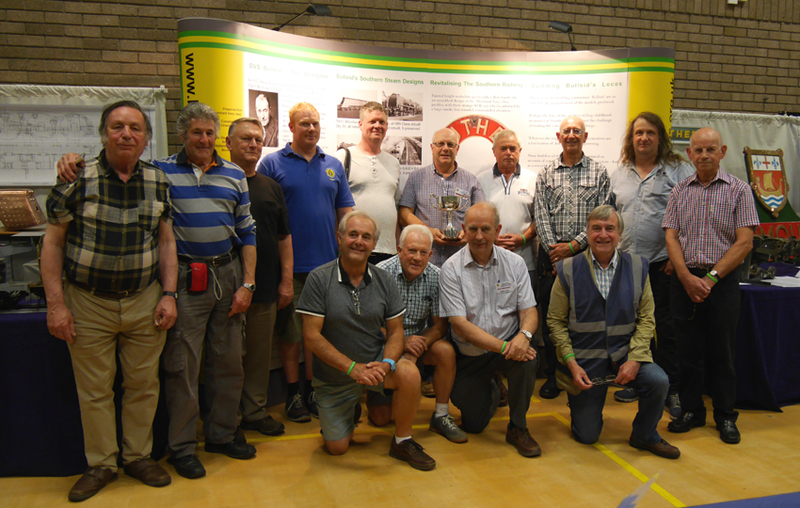 We had a couple of goes at getting our Bulleid Builders together for a group shot; this photo taken towards the close of the Show on Sunday, with most of us in frame - but with the distractions of a fine exhibition, it was difficult to round up everyone at the same time. However, here are some : from the left, top row : Mike Casey, John Cottam, Roger Lainson visiting from Aus, Will Powell, Tony, Rob, Doug Rundle, Nick Feast, Will Naylor and Les. Bottom row from the left : Stefan Owen, John Lloyd, Bernard North, and Bob Gates.